More than 160 people took part in a webinar organised by the IOSH Construction Group, where they heard about of the efforts being made to raise awareness of the issue. Guest speaker Martin Coyd OBE, immediate-past Chair of the Build UK Health Group and a member of the Health in Construction Leadership Group, spoke of plans to establish a new UK-wide scheme to promote greater mental health awareness and support for construction workers. The Mates in Construction (MIC) suicide prevention initiative has been operating in Australia since 2008, and it is hoped it could start being implemented across the UK later this year. Estimates have shown that workers in construction are six times more likely to commit suicide than die from a fall from height. “There is this tough-guy image which is very prevalent in the construction industry,” Martin said. “We get out of bed, often before 6am. We travel distances to get to work and we work in an attritional environment that is sometimes cold, wet or hot, and it is hard work too. “Job security can also be poor with many workers transiting from site-to-site as they pursue the work. 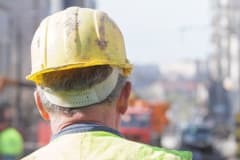 Construction workers can often be reluctant to speak about their mental health, Martin said, due in part to the pressures of delivering on a project. He and the Health in Construction Leadership Group are leading on the MIC initiative in the UK. The scheme would give construction workers an induction on mental health, and see the likes of supervisors and foremen trained to offer support on-site. Martin said: “I believe we as an industry have an obligation to challenge this. He added: “People talk about a growing problem with mental health. I think it’s always been there but the pressures of life are now extraordinary. The Health in Construction Leadership Group was established last year with the aim of uniting the construction industry to eliminate the risk of workers contracting health problems. IOSH is an active member of the group, which also comprises of contractors, clients, the HSE, professional bodies, trade associations and trade unions.